One should not complain about gifts, you know, free stuff, perks, etc. So, reluctantly I agreed to represent the company at a conference in Rome, Italy, even though the timing of this business trip butted right up against my Arizona deer hunt. That hunt was one of those early, 4-day only affairs in whitetail country. A single vacation day ahead of business bridged the weekend, so Julie and I could visit my folks in northern Germany. Those three days were worth it! I hadn't seen them for about three and a half years, and they hadn't met Julie yet. We had large family get-togethers, enjoyed fine wild boar roast, hunted one morning, played with the new additions to the family, great niece and great nephew, and just caught up with things. Needless to say, time was flying, and so were we, towards Rome, on Monday morning. Business was a breeze, Rome old and interesting. You want an adventure? Go to Rome, rent a large car, and (try to) merge into their crazy traffic. Still, I was glad to head back to Arizona Thursday morning. We finally arrived at home around 7:30 PM Thursday, Phoenix time, after the Hotel alarm had shocked us 22 hours earlier. Didn't matter. After making a stack of sandwiches, packing guns, ammo and optics, Herr Oberst (Mike) and I were headed towards Mount Graham in my 4Runner, with Gary following in his Nissan pickup. The first miles were piloted by yours truly, but shortly after Globe severe jetlag forced me into the passenger seat. Oberst took the controls for the next good hour. By then I had recovered and slept enough to, shall we say, rally through the final dirt road miles. Going fast, and sometimes a little sideways on the muddy road to and past Klondike kept me sharp, thus conquering the jetlag's nagging residuals. 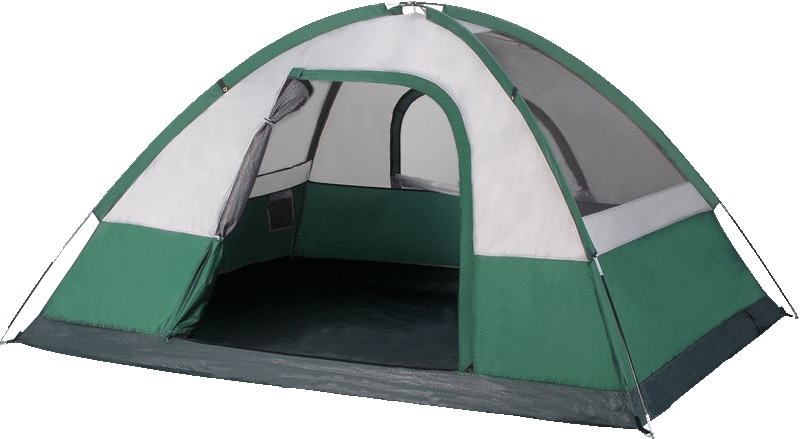 By one in the morning we had finally set up camp and crawled into our sleeping bags. Even without alarm I was up around 5:30. The instinct to hunt must have been stirring. I motivated Gary and Mike. The plan was simple. Make the trucks do the hard work, crawl up the mountain road in the Toyota, park, and hunt downhill back towards camp. Due to the rain from the day before we had a fog delay. That soup was indeed thick, limiting visibility to way under a hundred paces. We waited for about half an hour, then pressed on as the sun was burning through. The result was a crisp, fresh morning. Around 10AM we reached camp again, with the sight of only two does as our accomplishment. That did not rob my optimism whatsoever. 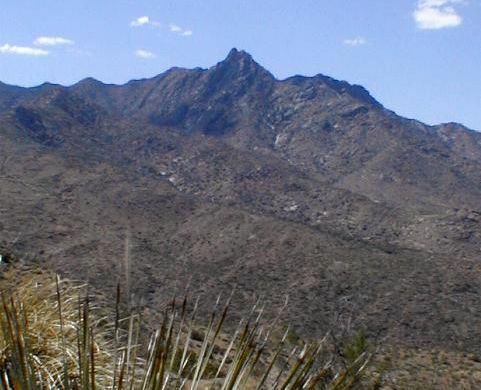 In February of 2003 I had hunted javelina here, not finding a single porker, but flushing out several whitetail bucks. Determined, after Gary drove me up to retrieve the Toyota, we repeated the process. Now a few ridges further north of camp, we hunted back towards the main wash or canyon that hid our camp. Almost immediately two does made their appearance. As I checked on them, hoping to find a buck fleeing with them up the next slope, a flash way down the hill got my attention. The binoculars only confirmed 'a whitetail', literally, leaving the scene, but at least towards the ridge that Gary and Mike were covering. This deer had spooked from over four hundred yards away. Or do they lift their flag every time they motor uphill? The two does did not tempt any males into fatal maneuvers, so I continued slowly downhill. How far did this nervous whitetail travel? And did it even have antlers? Soon my ridge was splitting. I followed the right crest first, closest to Gary and Mike. There, deer, right down from Mike's position. Bummer, the 10x revealed no antlers, probably the two females I had seen on our first patrol. Nothing else got nervous. At the point, the end of my ridge, I tossed a rock. One lone javelina lost its cool and fled down the wash. I labored back up to the split, and crept down the left branch. This ridge terminated into a rather wide point, too wide for me to observe both sides. We had radio contact. I informed Gary that I had seen 'a deer' that I suspected of being on this point here somewhere. When he confirmed that they could see the point, and their side of it, I drifted down the opposite side, admittedly full of anticipation. After not even fifty paces 'a deer' was moving on the next slope, about 150 steps away. A buck! Handsome little three-point rack. If it was the same critter I had seen a glimpse of earlier, he had just barely crossed over the crest and bedded down. I seriously had expected him to be on my ridge, or even one more over, under Gary's and Mike's feet. Pretty boy stopped just as the crosshairs in the Leupold 2.5-8 superimposed on his chest. A little more pressure, and NOTHING. The damn safety! Usually I never use it, but this terrain was so steep at times that I considered the safety as a little extra margin. My anxiety escalated when shoving the lever forward clanked really loud, amplified by the composite stock. The buck hadn't moved, but I expected him to, rushed the shot, and guided the 150 grain Ballistic Tip into his guts. Now really upset, the next two shots were even worse, misses. Fortunately, the deer was severely hurt, and bedded down after traveling maybe twenty five yards. A fourth round finished him off, but it was again a lousy shot that went diagonally through him, instead of punching the neck. This was adding lots of supporting data to "Hunting is not perfect", and I swore right there and then to practice a lot more with my new Remington 700 Titanium in .308 Winchester (a bunch of Sierra 110 HPs are on order). My shooting made me anything but proud, still, the hunt was over. I had a nice deer down, and was very thankful. Tagging and in this case really messy red work were next. Antlers became handles for the dragging journey, about a third of a mile down into the main canyon, upstream of camp. With Gary's and Mike's help, we hung the buck in a convenient juniper, and skinned him for proper and immediate cooling. Mike stood guard while Gary and I hiked back to camp, jumped into his Nissan to retrieve my Toyota. By 2 p.m. my naked buck was hanging in camp. Gary is no dummy. He jumped at my offer to carry the Titanium, an easy three pounds lighter than his Remington BDL 30-06 with laminated stock. This really matters when climbing steep stuff we were hunting. Dirk, my youngest stepson, had found our camp as we arrived with my deer. He took a picture of my 'trophy' with his cell phone - what will they think of next? OK, it's a good thing, because nobody else had a camera along. I guided Dirk for the rest of the weekend. My jetlag really hit home after dark. I had to 'play' with the campfire to stay awake. Parked in a lawn chair, my body just wanted to fold, as my eyes fell shut. We saw several whitetail ladies to keep things interesting. On Saturday morning I spotted a buck, unfortunately far away on a north-facing slope with plenty of vegetation, and no good option to get closer. But at least the buck was drifting our way. After observing him for over an hour, Dirk, carrying the Remington Model 7, desperately wanted to try a shot. The bullet struck way low, and two follow-ups did not touch hide, either. Therefore, the 'Rest of the Story' turns out boring. The 7mm-08 never connected with either turkey or deer in 2004. Gary and Mike never saw antlers, their guns remained silent. 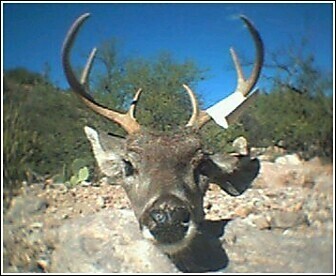 Not the result I had expected after seeing more bucks than anywhere else in Arizona on that previous pig hunt. Hey, they call it hunting, not shooting. And hunting, thankfully, remains unpredictable.